Lyon Marriott Hotel Cité Internationale is a large, modern business and leisure hotel. The hotel is located in central Lyon -the capital of Food. "Sunbathe on the hotel terrace with River Rhone views, explore Lyon attractions like the Museum of Contemporary Art and Tête d'Or Park with ease from this Lyon hotel. Enjoy italian food at the restaurant "Zucca". Unwind in the fitness center after a long day at the hotel business center." The Gala dinner will be held on the Rhone river. Cast off and enjoy a vibrant river adventure on-board the Hermès restaurant boat! The flagship of the Les Bateaux Lyonnais fleet, this upscale 50m-long ship welcomes us conference partisipants looking to discover Lyon differently. The ship provides a warm, cosy setting for the utmost comfort . BRIEF HISTORY and GEOGRAPHY: The Lyon metropolitan area had a population of 2,265,375 in 2014, the second-largest urban area in France. The city is known for its cuisine and gastronomy, and historical and architectural landmarks; part of it is a registered as a UNESCO World Heritage site. Lyon was historically an important area for the production and weaving of silk. Lyon played a significant role in the history of cinema: it is where Auguste and Louis Lumière invented the cinematograph. It is also known for its light festival, the Fête des Lumières, which begins every 8 December and lasts for four days, earning Lyon the title of Capital of Lights. Economically, Lyon is a major centre for banking, as well as for the chemical, pharmaceutical, and biotech industries. The city contains a significant software industry with a particular focus on video games, and in recent years has fostered a growing local start-up sector. Lyon hosts the international headquarters of Interpol, the International Agency for Research on Cancer and Euronews. It was ranked 19th globally and second in France for innovation in 2014. It ranked second in France and 39th globally in Mercer's 2015 liveability rankings. The country's 18 integral regions (five of which are situated overseas) span a combined area of 643,801 square kilometres (248,573 sq mi) and a total population of 67.25 million (as of June 2018). The sovereign state of France is a unitary semi-presidential republic with its capital in Paris, the country's largest city and main cultural and commercial centre. 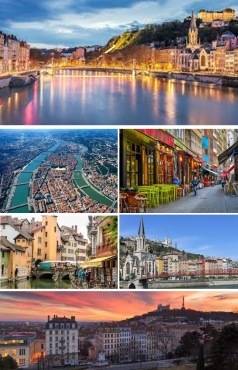 Other major urban areas include Lyon, Marseille, Toulouse, Bordeaux, Lille and Nice. During the Iron Age, what is now metropolitan France was inhabited by the Gauls, a Celtic people. Rome annexed the area in 51 BC, holding it until the arrival of Germanic Franks in 476, who formed the Kingdom of France. France emerged as a major European power in the Late Middle Ages following its victory in the Hundred Years' War (1337 to 1453). During the Renaissance, French culture flourished and a global colonial empire was established, which by the 20th century would become the second largest in the world. The 16th century was dominated by religious civil wars between Catholics and Protestants (Huguenots). France became Europe's dominant cultural, political, and military power in the 17th century under Louis XIV. In the late 18th century, the French Revolution overthrew the absolute monarchy, established one of modern history's earliest republics, and saw the drafting of the Declaration of the Rights of Man and of the Citizen, which expresses the nation's ideals to this day. France has long been a global centre of art, science, and philosophy. 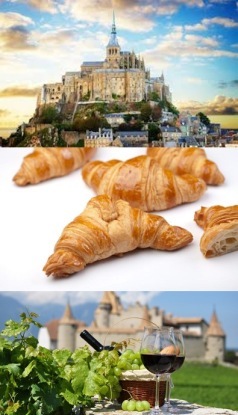 It hosts the world's fourth-largest number of UNESCO World Heritage Sites and is the leading tourist destination, receiving around 83 million foreign visitors annually.France is a developed country with the world's seventh-largest economy by nominal GDP, and tenth-largest by purchasing power parity. In terms of aggregate household wealth, it ranks fourth in the world. France performs well in international rankings of education, health care, life expectancy, and human development. France is considered a great power in the world, being one of the five permanent members of the United Nations Security Council with the power to veto and an official nuclear-weapon state. It is a leading member state of the European Union and the Eurozone, and a member of the Group of 7, North Atlantic Treaty Organization (NATO), Organisation for Economic Co-operation and Development (OECD), the World Trade Organization (WTO), and La Francophonie.